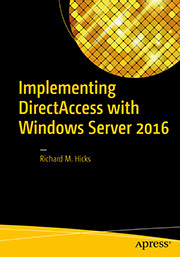 Windows Server 2012 | Richard M. Hicks Consulting, Inc.
DirectAccess administrators, and network administrators in general, are likely familiar with the terms “split tunneling” and “force tunneling”. 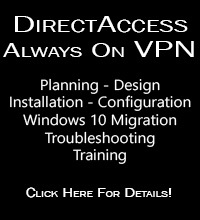 They dictate how traffic is handled when a DirectAccess (or VPN) connection is established by a client. Split tunneling routes only traffic destined for the internal network over the DirectAccess connection; all other traffic is routed directly over the Internet. Force tunneling routes all traffic over the DirectAccess connection. DirectAccess uses split tunneling by default. Optionally, it can be configured to use force tunneling if required. Force tunneling is commonly enabled when DirectAccess administrators want to inspect and monitor Internet traffic from field-based clients. Note: One-time password user authentication is not supported when force tunneling is enabled. Details here. Force tunneling is not without its drawbacks. It requires that an on-premises proxy server be used by DirectAccess clients to access the Internet, in most cases. In addition, the user experience is often poor when force tunneling is enabled. This is caused by routing Internet traffic, which is commonly encrypted, over an already encrypted connection. The added protocol overhead caused by double encryption (triple encryption if you are using Windows 7!) along with using a sub-optimal network path increases latency and can degrade performance significantly. Also, location-based services typically fail to work correctly. “Selective Tunneling” is a term that I commonly use to describe a configuration where only one or a few specific public resources are tunneled over the DirectAccess connection. A common use case is where access to a cloud-based application is restricted to the IP address of a corporate proxy or firewall. Using the Name Resolution Policy Table (NRPT) and taking advantage of DirectAccess and its requirement for IPv6, DirectAccess administrators can choose to selectively route requests for public hosts or domains over the DirectAccess connection. The process involves defining the public Fully Qualified Domain Name (FQDN) as “internal” in the DirectAccess configuration and then assigning an on-premises proxy server for DirectAccess clients to use to access that namespace. While some of the selective tunneling configuration can be performed using the Remote Access Management console, some of it can only be done using PowerShell. For this reason, I prefer to do everything in PowerShell to streamline the process. 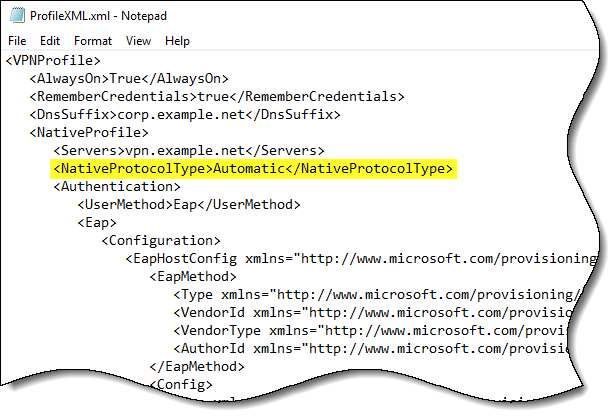 Run the following PowerShell commands on the DirectAccess server to enable selective tunneling for the “.example.com” domain. If Windows 7 client support has been enabled, run the following PowerShell commands on the DirectAccess server. 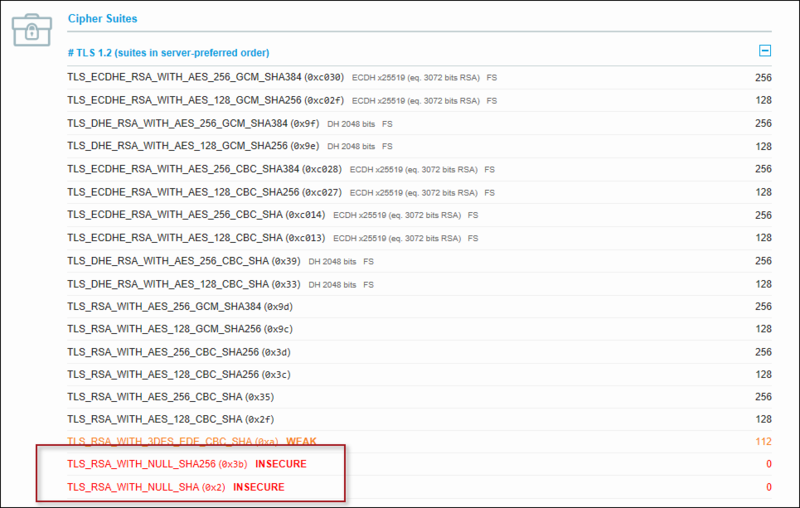 If multisite is enabled, run these commands on one DirectAccess server in each entry point. To remove a namespace from the NRPT, run the following PowerShell command. While selective tunneling works well for the most part, the real drawback is that only Microsoft browsers (Internet Explorer and Edge) are supported. Web sites configured for selective tunneling will not be reachable when using Chrome, Firefox, or any other third-party web browser. In addition, many web sites deliver content using more than one FQDN, which may cause some web pages to load improperly. As I’ve written about in the past, Windows 10 Always On VPN has many advantages over DirectAccess. One of the most important features is that Always On VPN is completely infrastructure independent. Always On VPN is implemented entirely on the client side, so there is no reliance on Windows infrastructure servers at all. In theory, you could deploy an Always On VPN solution using an entirely third-party backend infrastructure. This is crucial because many organizations already have security infrastructure in place today. However, there are still some compelling reasons to choose Windows Server 2016 as the VPN server to support Windows 10 Always On VPN. Windows Server 2016 includes a very capable VPN server in the Routing and Remote Access Service (RRAS) role. Using Windows Server 2016 RRAS will meet the requirements for many deployment scenarios. RRAS also provides some unique advantages too. The following are some important considerations for choosing RRAS for VPN. 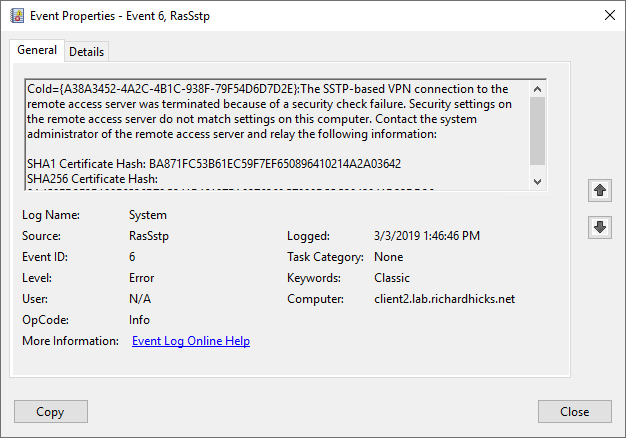 The RRAS role in included in all Windows server network operating systems and can be enabled easily using the GUI or PowerShell. RRAS is mature and well-documented, making installation and configuration simpler. In fact, all of the Microsoft Windows 10 Always On VPN documentation guidance references RRAS. No investment in proprietary hardware is required, because RRAS runs on Windows Server 2016 and can be deployed on existing virtual infrastructure. Deploying additional RRAS virtual machines enables quick and efficient scaling up of the solution without the need to deploy additional expensive hardware. Importantly, RRAS requires no additional per-client or per-device licensing. In addition, RRAS can be managed using existing Windows administration skill sets and does not require dedicated, and often expensive solution-specific expertise. RRAS includes support for modern VPN protocols such as Internet Key Exchange version 2 (IKEv2) and Secure Socket Tunneling Protocol (SSTP). IKEv2 is the protocol of choice or most deployments, and is required for supporting the device tunnel. SSTP is a firewall-friendly protocol that ensures remote Windows clients can connect from anywhere. Layer Two Tunneling Protocol over IPsec (L2TP/IPsec) and Point-to-Point Tunneling Protocol (PPTP) are also supported for legacy client compatibility. Although Windows 10 Always On VPN can be implemented using third-party VPN servers, it’s important not to overlook Windows server either. Windows Server 2016 RRAS has some important advantages over third-party infrastructure. RRAS is mature and well understood, with an abundance of published documentation available. 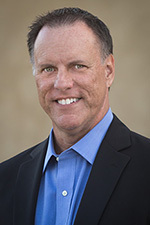 Leveraging RRAS eliminates the need for costly proprietary hardware and client licensing, while at the same time reducing administrative overhead and streamlining support. RRAS also includes native support for modern VPN protocols, ensuring reliable client connectivity from any location.